There is no known cure for Hashimoto’s disease, but hormone replacement therapy is a common and simple treatment. This typically consists of daily use of use of the synthetic thyroid hormone levothyroxine. This therapy usually needs to be maintained throughout one’s lifetime to keep the disease in check. Because the proper dosage may change over time, the prescribing doctor will monitor treatment every six to twelve months. Fortunately, levothyroxine causes no side effects and is very affordable. Hashimoto’s disease is an autoimmune disorder that affects the proper functioning of the thyroid gland. People who suffer from Hashimoto’s disease may develop hypothyroidism, a condition in which the thyroid does not produce enough of the hormones that affect metabolism. As a result, people with this disease might experience weight gain in the absence of overeating, and fatigue not caused by lack of sleep. If a physician diagnoses Hashimoto’s disease, patients will be prescribed hormone therapy to manage the effects of hypothyroidism. Because the treatment is slow-acting, it can take as long as a few months for symptoms to be relieved. 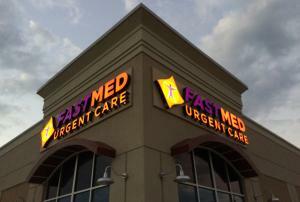 If you are bothered by your symptoms and can’t wait for your primary care physician’s regular hours — or if you do not have a primary care physician — visit your nearest FastMed Urgent Care location. We are open for extended hours during the week and are open Saturday and Sunday. Our medical professionals will begin testing to diagnose your Hashimoto’s Disease symptoms and start you on a treatment plan. We accept most private insurance plans as well as Medicaid, Medicare, and Medicare Advantage. We also offer a competitive self-pay program for patients without insurance, as well as a discount program to make your visits to FastMed Urgent Care more affordable. Contact us today and get the treatment you need!